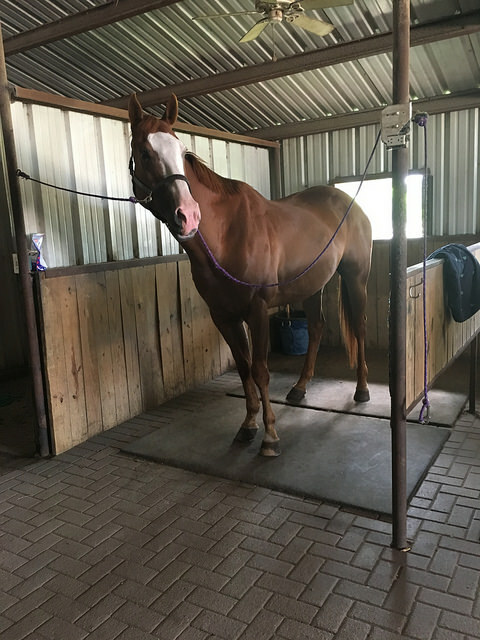 I’ve gotten a lot of items to review through the duration of this blog, but rarely is something immediately tossed into my daily barn routine. Grooming Hands, a curry comb like set of gloves, is one of those products. Since I first slipped them on, they immediately earned their place in my tack trunk as my go to curry brush. 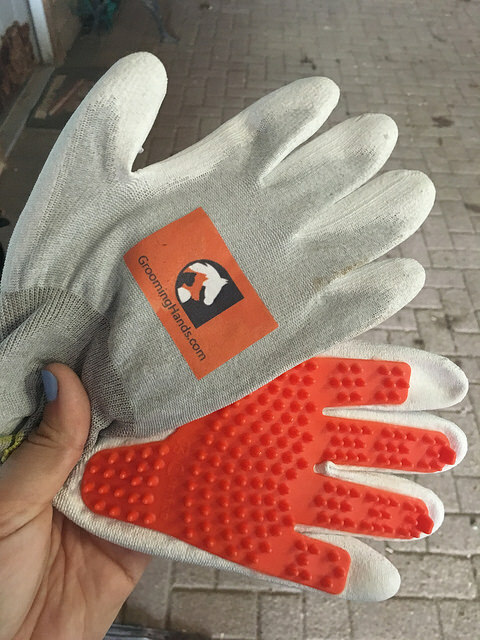 One thing I like about these gloves as opposed to other grooming type gloves that I’ve seen, is that they’re extremely light weight and breathable. Grooming Hands come in different sizes, so you don’t feel like you have a giant unusable mit on your hands if you have smaller hands like myself. Also the cloth material as opposed to rubber means I don’t have a sticky, sweaty hand inside the glove as I’m grooming my horse. So what did my horses think? If you know Simon in real life, you know him to be one of the itchiest creatures around who also loves his grooming. When I got these gloves out I thought they would be a hit with Simon… and I was right! I’ll let this picture speak for itself. They are easy to use and allow a lot of flexibility with your fingers. I find that I can manipulate the fingers to get into all the nooks and crannies of his itchy spots, especially along his crest and into the mane. The Grooming Hands also do an excellent job as a brush, leaving my horses shiny and clean after even a quick run down. As a product review? I love them. You can pick the Grooming Hands gloves up on eBay for $25.99, which might seem steep for a grooming product but you’re essentially getting two brushes (one for each hand). I also will say that the durability on these is very good. I’ve been using them every time I’m at the barn for months, and besides the white fabric being less white there is no sign of wear or tear on them at all. If you like grooming and/or have a horse that has a case of the itchies… get these! Now as the blog title suggests, I also have a fun little bonus for you on today’s review post. The creator of Grooming Hands, Barb Schuster, has been kind enough to answer some interview questions for me. 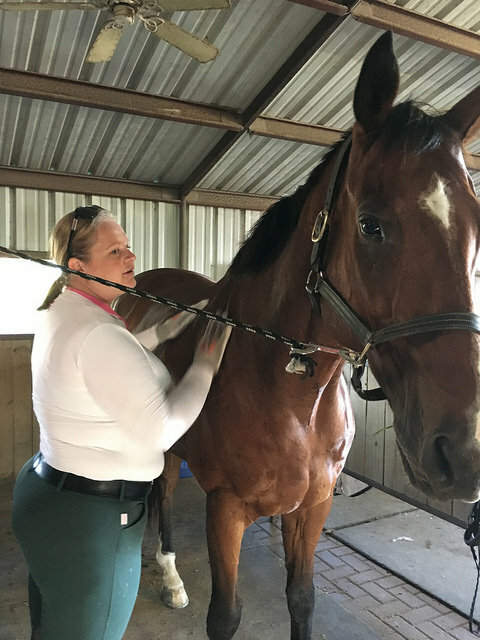 Equine entrepreneurs are both fascinating and inspiring to me, so I thought y’all might enjoy some Q&A! What made you decide to create Grooming Hands? It was in the winter of 2011, I was caring for a horse named Markley and my hands were cold. I didn’t want to take off my gloves or use a brush because my hands would get even colder. I also would build up static electricity and the horse would get shocked by the brushes I used. I began to scrub Markley with my gloves and thought: wouldn’t it be great to add curry like nubs on them? This idea was the spark that set me on a journey creating Grooming HandsTM grooming and massage gloves. Was there a specific horse that inspired the product? There have been many horses in my life that inspired Grooming HandsTM. It actually stems from when I was a child riding horses and my dad who was a good horseman. 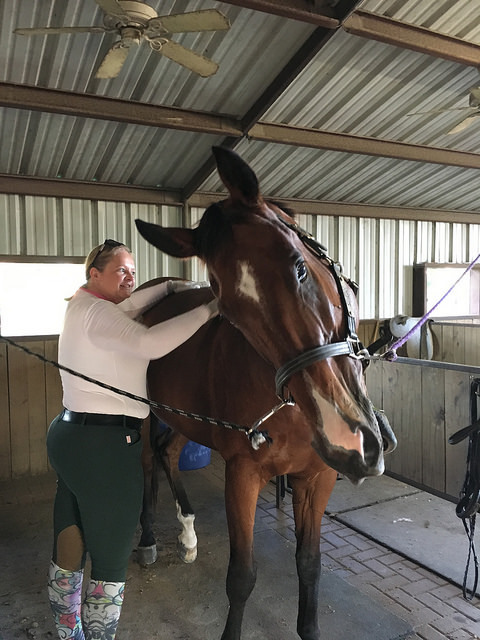 He taught me the importance of grooming and how important touch is to building a bond between you and your horse and that massage is also important. So I always gave my horses a good brushing and I often used my hands to scrub them and give them a massage. 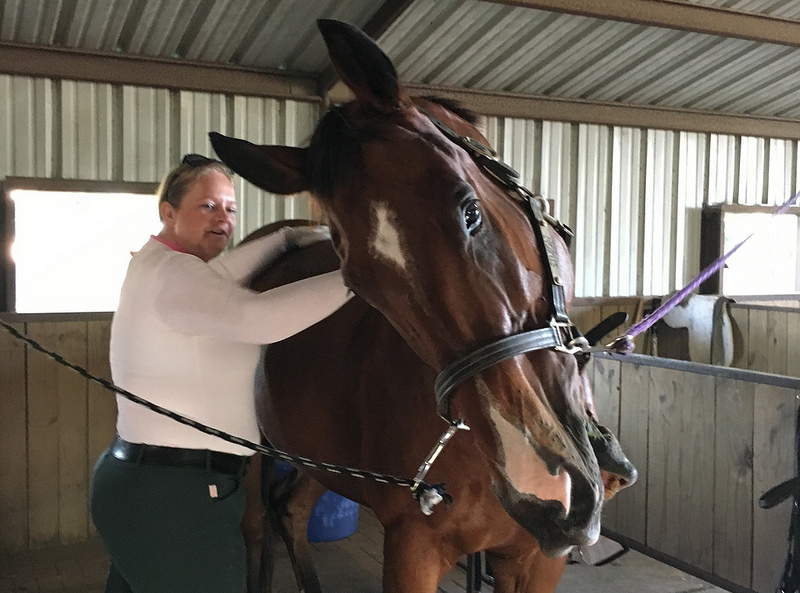 I realized when I worked with the thoroughbreds what a difference it makes for them when you use your hands and give them a good scrubbing/massage. I witness them feeling better and improving their running. What was the biggest struggle in turning Grooming Hands from a concept to a tangible product? Initially my biggest struggle was the question: how am I going to put the pieces together in a way that would be most beneficial to the groomer and pet? My biggest struggle now is finding a manufacturer. What advice would you give other equestrians with an innovative business idea? If you truly feel your idea can benefit others, find honest people to help guide you. Be creative and open to options, challenges, and suggestions. Keep yourself focused on the goal you want to achieve. A wise man told me that to be in business you have to be able to bounce back when you are knocked down. Most of all, know yourself, what you are able to handle, what you are willing to sacrifice, and if it makes sense for your financial situation. There are also business incubators out there, like the ones that helped me! I have been blessed with many good people who are helping me along the way! Thanks Barb for answering these questions and allowing me to review Grooming Hands. Ooo…These sounds like a great thing to have! I have small hands too and the curry combs I use for grooming always slip off my hands and then I’m bending under my horse to pick them up. Sounds like I wouldn’t have that problem with those gloves! These are definitely going on my birthday list! Or Christmas list! Or let me just buy something for my horse because I love him list. Okay, I might need to get some of these for Moe. That dude LOVES being scrubbed on his neck and belly with the jelly curry! I might need a set of these… Haffies are itchy, you know! I need to save up for a set of these! This makes me wish my horse would tolerate curries. I miss that feeling! I like that these come in different sizes! I have a pair of the Hand On grooming gloves that I got in a Heart to Horse box, but they are a little big for me. I love the concept. I may pick up a couple pairs of these as I don’t like to share grooming tools between horses. I’ve actually been thinking about getting some! AND I also have been struggling with a product idea so I loved the Q&A! Thanks!! My horse is less than enthusiastic about grooming but loves these silly gloves! I would never have bought them because my horse is ‘meh’ about grooming. He tolerates it, but any opportunity to walk away is an opportunity taken when grooming is involved. Anyway, I got a pair of these as a gift and so I set about to torture grooming one day and suddenly I had a neck stretching, lip quivering beastie! It was nice to groom him and I didn’t feel like I needed to hurry up and get it over with before he got too annoyed. Plus, with the gloves I can grab a brush, adjust his position or pull hay out of my bra and I don’t have to take them off! I loved these too! I think they’ll be super nice during all the winter hair growth. I will be getting a pair of these! What everyone said AND now you can have beautiful, strong, toned arms and shoulders on BOTH sides!